Picture prompted -- thanks to Jeff Bezaire. A piece of Nostalgia from a child's eyes. Such a treat, I’ve not been able to sleep from the excitement. We are going to see the sea! Of course I’ve heard a lot about it, read about it too, but this will be the first time that it I will have got to view it with my own eyes. They say it is an endless expanse of water that rushes in and rushes out. It brings with it a scent of adventure, the taste of salt. Is it not that which has lured many sailors out onto its waves? Those that are daring, venture in to it. Paddling their feet in the chilly water while others stand up to their knees in it. I do not think I’d dare. But as if the sea wasn’t enough excitement in itself, we are going to the pier. The big one at Blackpool, with all the entertainments and attractions. There will be so many treats on sale there, my mouth waters at the thought. I want to go on the Big Wheel! I hope Mama and Papa will allow me to. It turns around and lifts you up to sit high in the sky and you can see for miles and miles. I wonder if I’ll be able to see the place where the sea ends. There will be lots of people there as well as us. I’ll need to take care not to get lost in the crowds. I must make sure to hold on to Mama’s or Papa’s hand. So much excitement there will be for us all at Blackpool. And I will see the sea! Sea? I TOLD you this is excellent, Hull! You know, Hully, this could have been me telling this story. 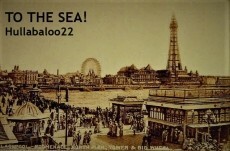 When I was five yeard old I got lost in Blackpool and it has emained a vivid memory ever since. I remember we had all been excited to see the sea and all the attractions. I went for a ride on a donkey on the sand and afterwards walked back in the wrong direction , and couldnt find my family. Luckily someone took me to the police station where I was reunited with them. This story transported me back to that day and that era. Simple pleasures that meant such a lot. Good job, Hully. Thanks, Sue. You know it's strange but I got lost on holiday too. My Dad and brother accidentally left me behind and I walked off the wrong way. It didn't take long for me to be reunited, but things like that are never forgotten I guess. This was written to be set around 1910 when trips anywhere unusual were seen as a treat. For most people at least. Can't say from experience because in spite of a certain member's speculation I sure wasn't around then. Thanks for giving it a read, Joe. A lovely piece, Hully! It reads like something out of a child's journal. The cover pic perfectly matches it, like a souvenir from the trip. Great job capturing the wonderment of a child! Thank you, Jeff. I'm glad it worked out okay. This page was created in 0.3508 seconds.